The Adventures of an Intrepid Reader: It's my blogiversary! Today marks four years since I started this blog! You'd think I would be better at it by now wouldn't you! LOL! Over the last three years, we have had the low key I-won't-mention-it blogiversary and a couple of retrospective blogiversary posts. This year is different though! We might call it the Party blogiversary! Let's see. What do we need for a party? Gifts? I can do that. Announcements? I can do that too! I'll start with gifts. I wasn't sure I was going to be able to do this because of the events of the last few days, but I have decided that I am just going to do it and worry about the costs later! Do what? Why have a giveaway of course! Over the next four days I will do a post with the synopsis of each book (who knows, maybe even a review) to help you choose. The winner will also receive a handmade bookmark. I love painting these ladies, and so have a couple of examples here, but if you would like a different colour dress, the please just let me know and I will make it for you in whatever colour you would like. A couple of runners up will also receive one of the bookmarks. I will probably put up a chart in the next couple of days so you can see the colour choices, and tell you about my sad obsession with Twinkling H2Os, which is the ink that I used to colour them. The giveaway will close on November 25, and is open world wide, as long as Book Depository ships to you. Just leave a comment on this post saying which book you would like to win. Please also make sure that your email address is either in your profile, or in your comment so that I can contact yoiu if you are the winner. Is that it? Well, no, it isn't actually. I am also incredibly pleased to announce that I have decided to host a reading challenge. For years, I have been intending to go back to the beginning and read my way through Terry Pratchett's Discworld series. Despite my best intentions, it just hasn't happened, so now I am challenging myself, and whoever else would like to participate to read some Pratchett during 2010. The sign up post will go up in a couple of days, but in the meantime, here's a sneak peak at the fabulous button that was created for me by Maili as a result of my cry for help the other day! Finally, I thought I would also quickly mention that it is just a few days until Kailana and I unveil this year's Virtual Advent Tour. We have had lots of fun doing this for the last couple of years, and I really hope that lots of people join in again this year! The proper announcement will be up shortly, so keep watching this space! So there you have it. A book giveaway, some book marks, a challenge and an upcoming event! Sounds like a pretty busy blogiversary to me! I love your blog. That being said I am currently reading "The Graveyard Book," and was trying to remember where I had heard about it. AH HA!! Liking it so far I'm to the point that Bod is going to school. :) Keep up the blogging I can't tell you how excited I am for the Advent. YAY Christmas. :) Happy Blogerversary. Happy Bloganiversary. You are awesome. Actually i would like to win the bookmarks...love bookmarks..but to choose a book it would be Sophie's Secret. Happy Blogiversary! I am excited by your giveaway because you suggested one book in particular to me and two of the others have been on my wishlist. So that means the fourth must OBVIOUSLY be great, too. Holy cow, I *love* those bookmarks. You did that? So cool. 4 years, congratulations. I'm being somewhat introspective for my 1st blogoversary. I'm trying decide if I've accomplished anything and what I want to do with it. How do you feel about the progress of your blog? Happy blogoversary!!! Those bookmarks are beautiful and I'll keep my fingers crossed that I win one. The books look good, too. LOL! Happy Blogiversary! I would love to win the Neil Gaiman book. I've been trying to buy or check this one out of the library and have not met with success. I have his American Gods book but haven't read it yet. I'm at pizzo_kathleen@yahoo.com. Thanks for the opportunity! P.S. 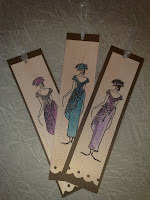 the bookmark are beautiful, do you really paint them yourself! Congratulations! I'd love to be entered -- my pick is "Swan Maiden". My e-mail is on my profile! Thanks! Happy blogoversary and great giveaway. I think I'll probably be in your challenge too. My son is reading the Gaiman book and loving it. No need to enter me in the give away. Happy Blogiversary!! Here is to another 4 years. I would love to be entered for The Hunger Games. Has it been 4 years all ready? That means we have known each other for over 4 years! Where does time go! Happy blogiversary! Happy blogoversary! Four years is a long time to keep up a blog. I only hope I can do the same. I may join your Terry Pratchett challenge - I've always meant to read more Discworld and 2010 is mostly empty right now! 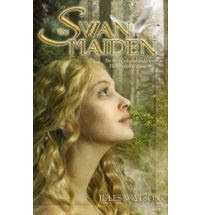 I'm so excited about this giveaway and I'd like to win a copy of Swan Maiden. Congratulations Marg! 4 years is a long time in the blog world and I love visiting yours daily. Thank you for 4 years of book recommendations and other interesting conversations. I'm not sure I'm up to that challenge though... I've been curious about Pratchett but I have so many challenges already...oh well, I'll think about it later after I inspect what's in the TBR pile. No need to put me in any drawings. I just wanted to tell you Happy Blogiversary!! Happy Blogiversary Marg! Wow, 4 years is an amazing achievement. You GO girl! Hey!! Congrats on four years, and you're going so strong. You know, you were one of my first blog buddies when I first started. I did your christmas tour my first year, and it really made me feel welcome in the blog community. So thanks! Happy Blogiversary!! Here's to another 4 great years! Happy Blogversary!!!!!!!! Many more to come I'm sure! Those bookmarks are beautiful! Happy blogiversary!! I love those bookmarks. And the Blog Advent Tour...Woohoo, had much fun with that last year, looking forward to this year with much joy. I love the idea of a Pratchett challenge. I've been steering clear of challenges, but I'm considering this one. Happy Blogiversary! Have a great rest of the week. The Terry Pratchett challenge is tempting. I've never read any of his books, but I've heard many good things. So I might just be joing that reading challenge. P.S. No need to enter me in the contest. Hey Marg, Congratulations. I've loved reading your comments on your blogs, and on HFonline. I've all but given up on ever getting the Kearsley book. Maybe I'll win it. And the bookmarks are beautiful. I just adore your bookmarks. They are quite beautiful and am interested in how you make them and the mediums you use. Happy Blogiversary Marg! I adore those bookmarks, they're fabulous. You know, if memory serves, I believe I've been reading you since the beginning..that means I've "known" you for 4 years. Isn't that lovely? Happy blogiversary! If I hadn't read all the Discworld books already I'd be all over this challenge. That said I want to reread some of them so I might follow you on an unofficial basis. Happy Blogiversary, Marg! I thought the bookmarks look awesome! Oh wow, congratulations on your bloggiversary! Your bookmarks are so sweet. Congratulations on 4 years in the blogging world! Happy Blogiversary!!! I would love to be entered to win Sophia's Secret. Thanks for the chance. BOth this one and your History Tapestry blog are excellent. YOu have def contributed to my TBR. Happy Blogiversary-4 years is quite an achievement! b. I would love a pink dress bookmark but really any color is good. c. I haven't read many of the Discworld novels but Death is definitely my favorite character so I like seeing him on the button. Happy Blogiversary! Your bookmarks look beautiful :) I would love to win Sophia's Secret - thanks! I am hosting a blogoversary giveaway too, so you might want to participate in mine. I love your bookmarks, and I would love to enter for "The Hunger Games". It's been all over the blogosphere and I am just dying to read it. Happy Blogiversary! 4 years running your blog - that's huge. And your giveaway istotally awesome. Please enter me for Swan Maiden. Your bookmarks are lovely, too. I'd love a lady in a dark blue dress :) But also pink, purple, green; I'm not picky. Congratulations on the blogiversary! What a great way to celebrate! Count me in! I would like to enter for The Graveyard Book, please....and the bookmarks are beautiful! I definitely could use another one. Wow, Marg! Four years already? Happy blogiversary :-) Here's to many, many more years of blogging! I would love to win The Swan Maiden. How exciting! I think the Graveyard Book would be wonderful! I am going to post this on my giveaway page too! Please count me in. I would love to win the Hunger Games. Happy Blog versary-I would like to read the Hunger Games-I have heard great things-actually I really want a book mark-they are great -I love book marks your remind me on ones I picked up at Versailles. Happy Blogiversary! Your blog just keeps getting better and better! I would love to win any book, but my first choice would be The Graveyard Book! Thanks so much! i would love to win hunger games please and those book marks are incredible! they look amazing! Congratulations on your blogiversary! I'd love to participate in your giveaway. :) I would really like to read The Graveyard Book by Neil Gaiman. what an awesome giveaway! I would love a chance to win Swan Maiden! I would love to win Sophia's Secret. Great giveaway btw. I would love to win The Graveyard Book. Congratulations! I just came to your blog from A Novel Challenge featuring Pratchett challenge (which I will be joining soon), so it's probably my first time here. Would love to enter the giveaway if you don't mind :). The bookmarks look wonderful! Congratulations!!! I would love to enter for The Hunger Games. Four years! Fantastic. Thanks for the giveaway. 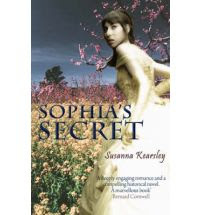 I loved your review of Sophia's Secret and look forward to reading it. I think I left my entry in the wrong place, since I am reading your posts backwards! I would love to win a copy of The Winter Sea. Happy Blogiversary as well! Oh have a happy blogiversary!!! I would love to read Sophia's Secret...and those bookmarks look very intriguing! 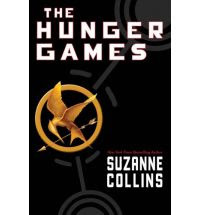 I would love to win The Hunger Games, I have heard so many great things about it but it is yet to make it on to my reading list. Happy Bloggaversery! Here is to many more! Great Giveaway! I would love the swan maiden. I'd love to win The Hunger Games. I don't think I ever happened to cross your blog before, still I'd like to wish you a happy blogiversary! Happy Blogoversary Marg. Please count me in for your giveaway. Totally agree with you about The Hunger Games and The Graveyard Book. I haven't read the other two. Your bookmarks are gorgeous, anyone would be very lucky to receive one of them! I'd love to read Niel Gaiman's novel. great comp; your book marks are exsquisite and beautiful by the way. i would like to read the swan maiden, it has a beautiful cover and reads like it could be something i'd enjoy. Happy Blogiversary! It's tough deciding between Hunger Games and Graveyard book, but I think I'll have to go with the Hunger Games. No need to enter me. Happy Blogiversary! Wow, 4 years and going strong. This month was my 2 year blogiversary. Happy Blogiversary! I think I'll go with The Hunger Games. I just found your blog today through Breaking the Spine and I saw this contest. Happy Blogiversary! I would love to be entered to win The Swan Maiden. And your bookmarks are beautiful! You're very talented! A very happy blogoversary to you. the bookmarks are very pretty and anyone would love to have them. So very nicely done. Would like to be entered for The Graveyard Book. Thanks for making the contest open for international readers. Much appreciated. Happy Belated Blogiversary! May you have many many more! 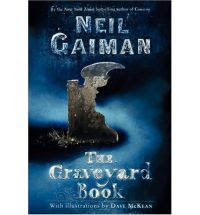 I would love to win The Graveyard Book by Neil Gaiman. I'd love to win The Hunger Games! Happy Blogoversary! Those handmade bookmarks are beautiful! I would love to win Hunger Games!